In 2003, the Canadian satirist Steven Lerner created the most famous ‘Googlebomb’ in history. Anyone searching for ‘French Military Victories’ using the Google search engine was directed to a fake website resembling the Google homepage, which read: ‘Your search did not match any documents. Did you mean French military defeats?’. Tricking the Google search engine like this requires some complex and intricate programming; almost as skilled as the craftsmanship which went into an early 19th century French tortoiseshell snuff box depicting a genuine French military victory. 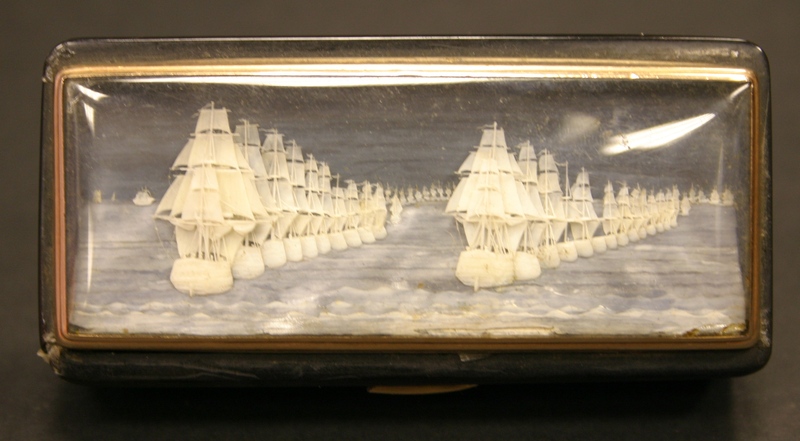 The tiny carved ivory diorama on the 87mm wide lid, depicting a line of two masted warships, is incredibly detailed. There is no clue on the gold mounted snuffbox as to the identity of the warships, but auctioneers at Moore Allen & Innocent in Cirencester have determined that the scene must be from the Battle of Chesapeake on 5 September 1781. How can they be so sure? Well in every satire there’s a kernel of truth. Due to he superiority of the Royal Navy, the French really did win very few victories. Google ‘French naval victories’ and there’s really only one result: the aforementioned battle; a decisive event in the American War of Independence. The French had the last laugh, though. Although the battle on the sea was far from conclusive, the standoff prevented the British from reinforcing the besieged Yorktown in Virginia. The surrender of the town led directly to peace talks, and British recognition of an independent United States of America. Thus, it could be argued, it was the French wot won the American War of Independence, not the Americans. The snuffbox is expected to achieve between £500 and £800 when it goes to auction on Friday, May 25. 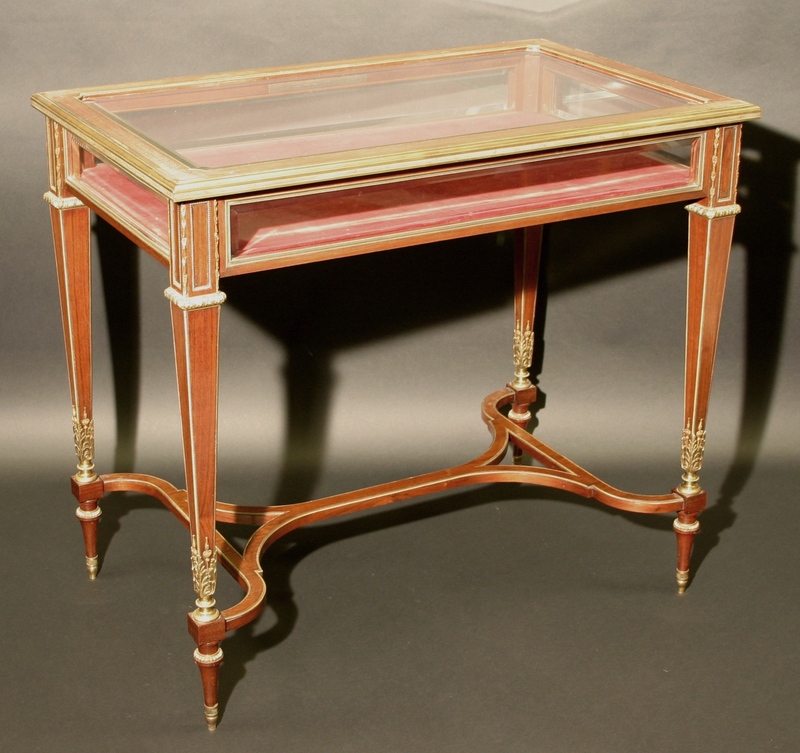 Another French antique with an interesting history is a 19th century rosewood and brass bound bijouterie table in the Louis XVI manner, which was previously sold in 1996 by Sotheby’s in London as part of the sale of the contents of Ickworth House in Sussex. Today the east wing of the stately home, which is owned by the National Trust, is a 27 bedroom hotel, but in 1996 it was the the home of John Hervey, 7th Marquess of Bristol, who became famous for squandering his £35 million fortune on drugs and wild parties. The table is expected to achieve between £3,000 and £5,000, which coincidentally is what the aristocrat was worth when he died, aged 44, in 1999 of an AIDS-related illness. Now, if the creations of the Martin Brothers weren’t conceived during some drug-fuelled wild parties, they certainly look like they might have been. 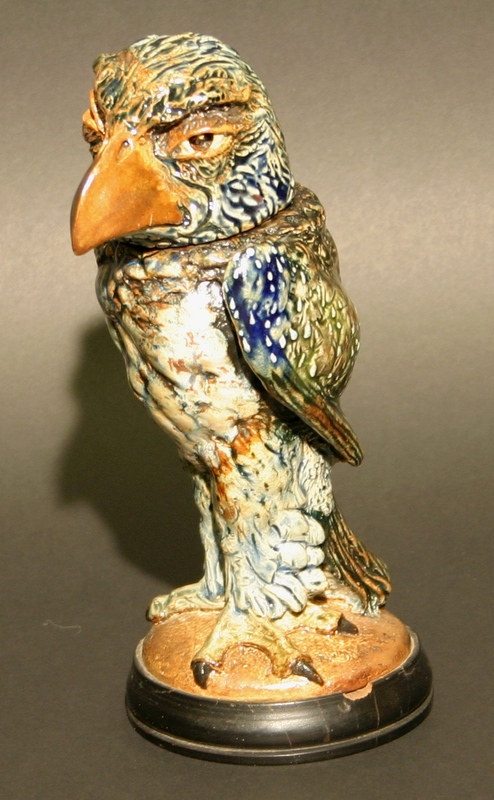 The four London-based artists, who worked between the 1870s and the First World War, were best known for their distinctive stoneware, including the eccentric and grotesquely modelled ‘Wally Birds’, one of which is going to auction with an estimate of £5,000 to £7,000. The blue and green mottled bird, with wild eyes, stands at 23cm tall and is inscribed to the rim ‘R W Martin & Brothers, Southall, 4.3.1911’. So far as Wally Birds go, it’s one of the more normal looking ones. No two are alike, and the wackier the better as far as collectors are concerned, with some making in the tens of thousands. The auction contains nearly 300 lots representing the best antiques from the Cotswolds – like the early Gordon Russell of Broadway oak framed armchair with unusual arm design, which is expected to make £2,000 to £3,000 – to the exotic, including a late 19th century Tongan carved hardwood paddle war club, with is attracting a great deal of interest from the South Seas region and should achieve around £1,000 to £1,500.